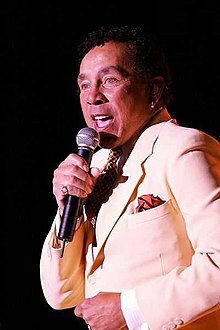 William "Smokey" Robinson, Jr. (born February 19, 1940) is an R&B and soul singer and songwriter. Robinson is noted for being one of the primary figures associated with the Motown record label, second only to the company's founder, Berry Gordy As both a member of Motown group The Miracles and a solo artist, Robinson recorded seventy Top 40 hits for Motown between 1959 and 1990, and also served as the company's Vice President from 1961 to 1988. And it's much too wide for you can't get across to the other side. Just a one more time like I did before when she was mine all mine. I'm gonna get to you, no matter what I have to do. There's still some things that you don't understand now. Keep your freedom for as long as you can now. You better (uh-huh) shop around. Sit him down upon my knee and here is what I'll say. You might lose your lover, people do sometime. Oh, but it won't make sense for you to sit around cryin'. Sometimes, you're gonna have the blues. Well it may take years, but you're gonna shed some tears. 'Cause everybody's got to pay some dues, now, now. Everybody's got to pay some dues. All it does is make you cry. And compose you a tune. Give you lovin' warm as Mama's oven. Then I'll try something new. You've really got a hold on me, baby. When they saw that I was falling for you. You better beware they told me that girl ain't gonna be true. Have you thinking that she really, really care. Then-a, then she'll let you down, she'll really let you down. She's a girl with no understanding. She'll let you drop and say... have a happy landing (happy landing). He's partly a boy in his heart. I did you wrong; my heart went out to play. But in the game I lost you. What a price to pay, hey I'm crying. 'Cause I tell a joke or two. good look at my face. You know my smile looks out of place. My girl has gone, and said goodbye. Don't you cry, hold your head up high. 'Cause there's a right girl for every guy. That would only break my heart. Now honey, that's quite a different subject. Give you the wrong impression. You're gone and I'm hurtin' so bad. Like a clown I pretend to be glad. Don't be confused, the way is clear. And if you want it, you got it forever. This is not a one night stand, babe, yeah. So let the music take your mind, whoa. You're gonna fly away, glad you're going my way. The music is playing for love. Cruisin' is made for love. This page was last edited on 12 August 2018, at 11:34.